Portland? What are you doing in Portland? The Year of Puzzles continues with a stop in Portland, Oregon. You'll have to read the story to understand more. While you're visiting, you get to solve a very nice, oversize Rows Garden puzzle by Patrick Berry, who, it so happens, invented them. If you're solving in the Puzzazz app, you need to get the latest update and then sign into your Puzzazz account by clicking the Sign In button in the upper right corner of the bookshelf. Enter your email address and password for the Google account you're using for Puzzazz. Once you've signed in, the Year of Puzzles will appear on the Owned Books shelf and any books you have purchased in the app will also appear on your account page on our web site. If you're not seeing the Year of Puzzles, make sure that the email address you gave us in your survey is the same email address you're using to sign in. If you're solving on paper, head over to the Year of Puzzles page to download a PDF of Chapter 2. You can also download a PDF of everything so far. 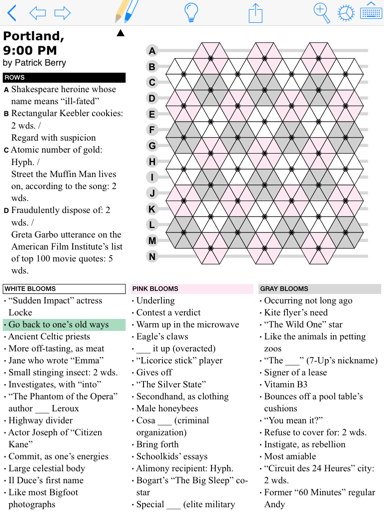 Don't forget to tell your friends about the Year of Puzzles. When they visit the Year of Puzzles page, they can download the first chapter and puzzle so they can check it out before they buy. Note: If you pledged at the INITIATE level and didn't get the Year of Puzzles, you can still buy it either in the Puzzazz app or on the Year of Puzzles page.